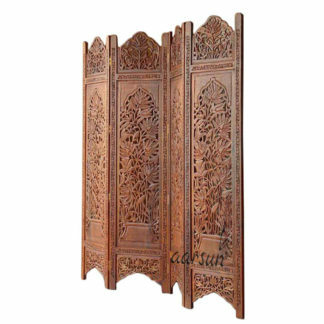 Hand-carved Room Dividers made from Seasoned Sheesham Wood with premium finishing. 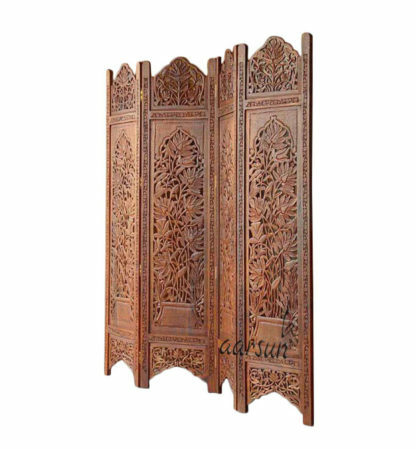 Aarsun Woods brings to you Traditional Wooden Partition Screens in 4 Panels made from Seasoned Sheesham Wood (Indian Rosewood). Partition Screen in the mid century were used as a Decor Unit and as a Privacy Screen. However, in the modern world, it is most efficiently used as a Room Separator. The Room Divider smartly divides the room in different compartments for better space utilization. The Partition Screen 0047 is a classic example of the Luxurious Era of the Mid Century. The designs were greatly influenced by nature and brought us closer to the Flora and Fauna. This particular room divider reflects the same era with Flora and Fauna elegantly carved out in Sheesham Wood by our experienced artisans. The Vintage natural polish look adds a touch of royalty to the unit. The partition screen can also be extended to more panels if you like as each panel has a standard panel of 20 inch front width and 72 inch Height. Most of our Room Dividers are dispatched within 4-5 days after receiving the order. However, the customized units usually take 20-25 days to manufacture. Please note that as this is a handmade product, there might be a slight difference in size as well as in the shade as each wood-log has its own texture and shade which gives it a unique look. Also, handling time depends on the availability of the products. Please contact us to confirm the readiness of a particular design. In case you are looking for Mango Wood & MDF Room Dividers , Handmade Mango Wood Partition Screens, also at Handcrafted Mango Wood & MDF Wooden Room Divider.